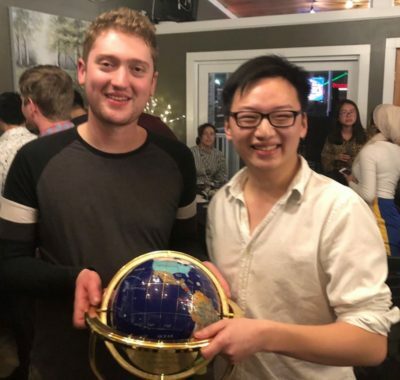 The HWS Round Robin 2019 was won by Oxford (Kit Mercer, Jason Xiao) speaking in Opening Opposition on the motion “This House believes that the Black Lives Matter movement should embrace open carry gun laws and engage in armed community patrols”. The Runner-Up was Melbourne (Stuart Dixon, Connor O’Brien) in Closing Opposition, on a 3-2 split decision. In Opening Government was Harvard HN (John Hunt, Michael Nehme) and in Closing Government was Harvard DH (Danny DeBois, Mars He). The final panel was chaired by Eric Barnes with a panel of Harry Elliot, Ameera Natasha Moore, Amelia McLeod, and Buzz Klinger. The top speaker for the second time was Danny Debois, with an average of 82.6 speaker points. The Steve Penner Honored Adjudicator award was awarded to Dan Lahav. The motions committee consisted of Chief Adjudicator Ameera Natasha Moore, with Amelia McLeod, Archie Hall, Jasmine Ho, Michael DG, and Paul Smith. At the Round Robin, each team is ranked by two judging panels and receives separate adjudications. Speaker points and team points are aggregated across both panels. Thus, the potential number of points available are 30. The tabs are available here. Ties in both team and speaker ranking were broken on direct competition results. R1: Infoslide: In academic settings, “the humanities” is contrasted with the study of natural sciences, social sciences, and professional trainings. Core fields in the humanities include: literature, philosophy, history, religion, art. Motion: This House regrets the decline of the humanities in higher education. R2: This House supports laws that protect the health of fetuses (whose mothers intend to carry them to term). R3: Infoslide: The British Labour and Conservative Parties are currently in negotiations for a compromise Brexit deal. Any deal that is likely to emerge will be a “soft” Brexit. In the event that current talks produce a compromise Brexit deal, this House would put it to a referendum with “remain” as an alternative. R4: Infoslide: For the purpose of this debate, the state of being contented refers to one’s overall satisfaction with one’s life. A contented person may have good or bad days, and fluctuations in mood, but their wholistic assessment of their life is that they are content with what they have, even if what they have changes. This House would take a pill that permanently made one contented with one’s current life situation. Infoslide: The Black Panthers began as a group of black citizens in Oakland, California who engaged in armed patrols of the city streets, specifically focusing on observing police behavior and arrests. In response, California enacted much stricter gun control legislation. Motion: This House believes that the Black Lives Matter movement should embrace open carry gun laws and engage in armed community patrols.